I didn’t know quite what to expect when I started reading ‘The Guardian Angel’s Journal‘ which is Carolyn Jess-Cooke’s first novel. The publicity had likened it to Alice Sebold’s ‘The Lovely Bones‘ and also one of my favourite films, ‘It’s a Wonderful Life’. I think that it was this second reference that really attracted me to the book and made me think that what I would read would be whimsical and uplifting like the film. I was wrong. However, having said that ‘The Guardian Angel’s Journal‘ is a fascinating and absorbing book that is definitely worth reading. At the start of the book, Margot has died, aged around forty and alone in a hotel room. That you would think would be the end of it but of course it is only the start. Margot is sent, as Ruth, to be a guardian angel – not just to anyone but to herself. Therefore she has to retrace her life and look back on all her past mistakes. She is only able to watch and to care, for if she attempts to change the course of events, terrible things may happen. Unfortunately, Margot’s life was not and is not a particularly happy one. Her drug addicted mother died in childbirth, she was fostered and then abandoned in a cold and chilling children’s home. After finally escaping she found a home with a lovely couple but sadly her new mother died. She left home for New York where she also started abusing her body through drink and drugs. Her marriage failed and her son ends up facing a murder trial. Ruth finds it very difficult to watch as she sees herself make mistake after mistake without attempting to intervene. I very much enjoyed reading that element of the book and found Margot to be a compelling character and one that would not seem out of place as a guest on the Jeremy Kyle Show! She appears to be a victim of circumstances but also of her own undoing. It was an absorbing tale as she seemed to plunge from one catastrophe to another as her guardian angel could only look on and watch, often in despair. However, it was the guardian angel aspect of the story that I found more difficult to enjoy. Although I liked the initial idea, the introduction of many angels all floating around and fighting with demons was a bit too much at times. Perhaps I should have expected this but it was the likening to ‘It’s a Wonderful Life’ that misled me. Having said that though, I did find this element interesting, although I have to admit that I prefer stories that are firmly seated in the here and now. 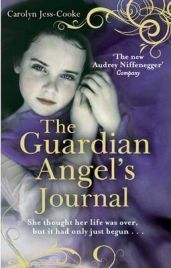 Overall, ‘The Guardian Angel’s Journal‘ is a well written book and is an absorbing tale of a life gone wrong. If you like your stories to be a little surreal I think you will love this book. With thanks to Little, Brown Book Group fro providing a review copy to us. No Comments on "The Guardian Angel’s Journal"